Brenda Russell is proud to present a new listing this House for sale, 945 Runnymede Place, South Oak Bay, Victoria, BC, V8S 2V8. Set amongst manicured lawns and gorgeous gardens, this beautiful home is a retreat that offers space, privacy and solid 50's luxury. Entry to this home is along a vine-covered walkway that leads to the solid front door. Open the door and step into a living room complete with oak floors, gas fireplace and a large picture window that frames views of the beautiful front gardens. To the side is a formal dining room that opens out to a large patio perfect for entertaining or hosting pre-dinner cocktails. French doors lead to the kitchen. Designed with entertaining in mind, the gourmet kitchen features granite countertops, a suite of stainless KitchenAid appliances. 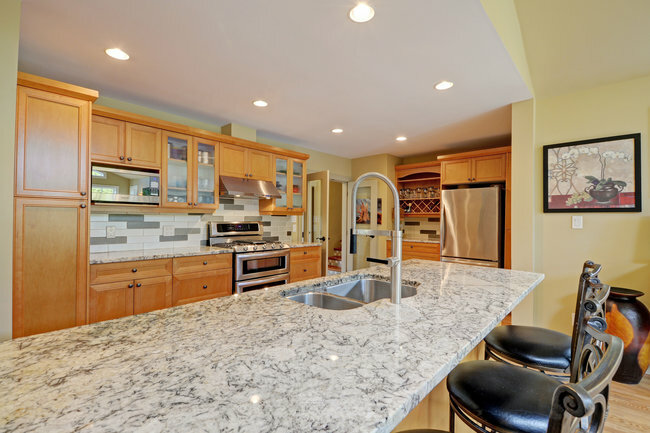 Plenty of storage, quality fixtures and a large breakfast bar where your guests can gather as you create. The separate laundry area has lots of built-in cupboards and access to the rear yard. The kitchen overlooks an open-plan living space. Here, large windows allow natural light to flood the home as well as offer views over the entertaining deck and out to the rear yard. A gas fireplace creates a cozy space for those cool winter nights, while the pitched ceilings allow great ventilation year-round and an additional heat pump system offers complete climate control. An oversized timber door leads out to the sunny deck relax and enjoy your morning cup of coffee in privacy. There are three bedrooms, one with french doors that overlooks the private rear yard, all with built-in closets and access to the full bathroom with twin granite vanities, soaker tub and separate shower. The finished lower level offers the potential for guest accommodation with separate entrance, bedroom, built-in closet, three piece bathroom, family room and a large storage area complete this level. This wonderful home has a double garage. It is located within walking distance of Oak Bay Village, the ocean and the bus route that will take you to the University of Victoria. Enjoy a choice of excellent private and public/immersion schools. For the investor, the home is currently tenanted on a fixed-term lease until January 30, 2018, with the tenant happy to stay for another 12-month lease. Alternatively, for those seeking a permanent family home, the property can be presented ready for the new owners to move right in. Once viewed, you will appreciate 'Runnymede Place' and agree it is special and offers lots of charm.